Drawing on 2 decades covering global development as editor in chief of Devex, Raj Kumar explores how nontraditional models of philanthropy and aid are empowering the world’s poorest people to make progress. Old aid was driven by good intentions and relied on big-budget projects from a few government aid agencies, like the World Bank and USAID. Today, corporations, Silicon Valley start-ups, and billionaire philanthropists are a disrupting force pushing global aid to be data driven and results oriented. This $200 billion industry includes emerging and established foundations like the Chan Zuckerberg Initiative and the Bill and Melinda Gates Foundation. Entrepreneurial startups like Hello Tractor, which offers an Uber-like app for farmers in Nigeria, and Give Directly, whose app allows individuals to send money straight to the phone of someone in need, are also giving rise to this new culture of charity. The result is a more sustainable philosophy of aid that elevates the voices of the world’s poor as neighbors, partners, and customers. 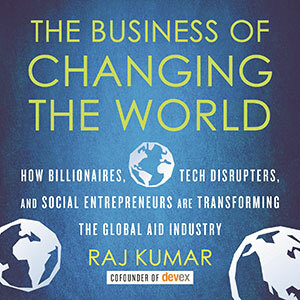 Refreshing and accessibly written, The Business of Changing the World sets forth a bold vision for how we can use our vote, our voice, and our wallet to turn well-intentioned charity into effective advocacy to transform the world for good. Businesspeople, policymakers, entrepreneurs, nonprofit executives, philanthropists, and aid workers around the world will all be influenced by this transformation.